Technology and the internet have completely changed the way we live, work and shop. In fact, things have changed so much that even our brains have been rewired. It's important to understand that today’s buyer thinks very differently than before. Your online content, whether it’s your website or social media, is most likely to be the first touchpoint that potential customers have with your business. 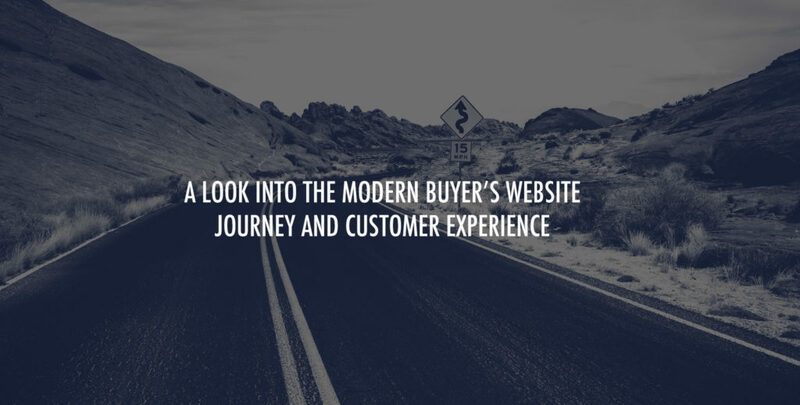 However, most people aren’t ready to buy when they land on your site for the first time. Or even the third or fourth time. In fact, by the time you actually hear from a buyer they are more than 80% of the way through the buying process. With most people mobile and connected 24/7, the online and offline worlds are no longer separated. Things are changing rapidly, and the future belongs to those who can adapt to those changes. What worked in the past will not work today. The good news is that many of these changes give small businesses a big advantage in today's world. Here are some of those key changes that you need to know about in 2017. Psychology, habits and technology: what motivates today’s buyer? Today people no longer rely on 'sales experts' to get the information they need. Instead, buyers are doing their own research and finding most of their information online through multiple resources and channels. Almost all of your prospects will check out your website before they decide to buy from you or contact your business. 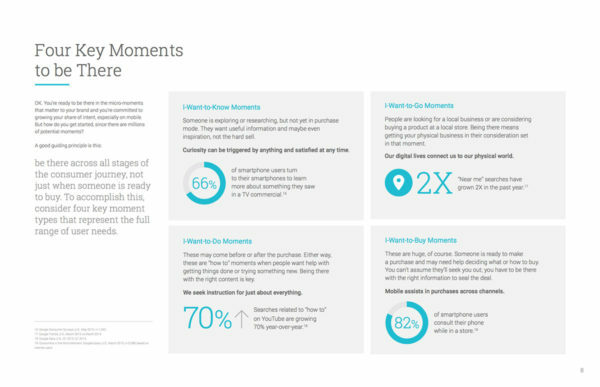 Google calls these the Micro-Moments that lead to purchase. Someone who is exploring or researching, but is not ready to buy. They want useful information, and maybe even inspiration, but they don't want the hard sell. Having great, useful content fulfills this need (see below). People are looking for a local business, or are considering buying a product at a local store. Local SEO optimization is extremely important. If people are searching for businesses near them and your website and business do not come up, then you’re missing out on a lot of opportunities. 'How to' moments where people want help getting things done or trying something new. Are there additional tips on your website for customers who buy things from you that you could share? Home project how-to’s, photography tutorials, craft projects, other uses for a product, and so on. People are always looking for inspiration and tips. Like the ‘I-Want-To-Know Moments,' being there with the right content fulfills this need. And it’s also key to establishing yourself as an authority in your niche. When people are ready to buy, having the answers they need and making the buying process as seamless as possible, no matter where they, are is important to converting purchases. Content drives leads, customers and sales, and as mentioned in the last section it’s the key to reaching potential customers at key moments. But your content must stand out. It must be really great content that is 10x better than what your competitors or others in your industry are doing. You often hear that good content is the key to attracting your targeted customer, and that’s true. However, today ‘good content’ is not enough - everyone is creating content now. You need to create killer content that’s above and beyond what the average business is doing. Rand Fishkin calls this 10x in Why Good Content Needs To Die. "Getting to the 'why' of the brand is where the future of the luxury market will be built." Pamela Danziger, What Do HENRYs Want? Pamela Danziger of Unity Marketing has done extensive research on what affluent buyers want and how they shop. She coined the term HENRY'S (High Earners Not Rich Yet) to describe today's luxury buyer. Status symbols today are less about acquiring things from traditional high-end luxury brands and more about brands that really express one's values and identity. Purchases reflect who people are and what they value. Status, exclusivity and conspicuous consumption are out-dated, and often repel many affluent buyers. Having a strong brand identity is the key to connecting with more of the right customers today. Many buyers today don’t trust big-box businesses and brands, and often feel disrespected by many businesses. Which is why reviews and testimonials are huge drivers of purchases. Not only do many buyers not trust big brands, they find them uninteresting and impersonal. Many affluent consumers especially are looking for something more unique and personalized, and they are going to small independent businesses to find those things. Whether it’s having access to the information they need when they are researching products, being able to control their privacy online, or even leaving a review on Yelp, no one wants to feel like they are being tricked or like they are being 'sold' something. Buyers want to be in control. Displaying pricing on your website is one example. In general, if a potential customer has to call or email you to find out the price of something then you’ve probably lost them. This is more of a challenge for businesses who offer custom services. Putting your pricing front and center isn't always the best choice. But it needs to be addressed somewhere, which is where informative content comes in. Online reviews are another example customers being in control. Consumers today want to feel special and appreciated, they want brands that make them feel cool, and they want to be respected. Technology has made people feel invisible, and many seek out brands that empower them to express themselves, whether through a purchase or participation. Exceptional customer service and a strong 'Why' will put you miles ahead of your competitors. Creating an experience that goes beyond just a product or service is important if you want to stand out, especially in today’s connected world where these experiences are often shared on Snapchat, Instagram and other social media platforms. Your website should be easy to navigate and browse. It needs to load quickly, and most importantly it should be informative. If buyers can’t easily find what they are looking for, whether it’s information or to purchase, they will ditch your site and move on. Time is incredibly valuable, and it's also in very short supply. On top of that, people are even more impatient today than before; they expect everything now. In Decoding the New Consumer Mind, the short attention spans of consumers today heavily influence purchasing behaviors. Kit Yarrow calls this I want it when I want it, or IWIWIWI. We want quick fixes, and we want them now. This is why having a fast and mobile-optimized site are so important in your business. Being aware of these buying habits and behaviors will help you have greater success when trying to reach your target customer. We’ll be sharing strategies over the next few months that will help you take advantage of these changes to grow your own business.